In June, 10th- and 12th-grade students at W.B. Saul High School of Agricultural Sciences (Philadelphia) installed a rainwater management garden on campus grounds, culminating a year-long planning and design process. About 70 W.B. Saul students were mentored under a unique pilot program that leverages experts from the CH2M Foundation (Englewood, Colo.) and The Nature Conservancy (Arlington, Va.) to provide project-based lessons in the disciplines of science, technology, engineering, and mathematics (STEM). 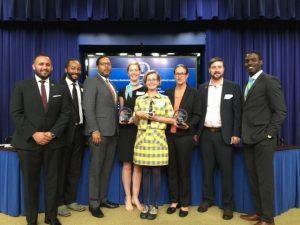 Last August, the partnership received the first-ever US2020 STEM Mentoring Award in the category of Excellence in Public-Private Partnerships during the annual White House STEM Mentoring Symposium. 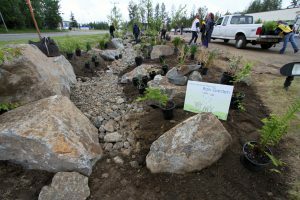 The rain garden’s construction, which was made possible by a $200,000 grant from the CH2M Foundation, will play a key role in an ongoing curriculum covering water conservation and stormwater management. A 2839-L (750-gal) cistern connected by pipes to the campus’ small animal lab stores rainwater from the adjacent garden, according to an article that appeared in The Review. The rain garden joins other hands-on teaching aids on the 53-ha (130-ac) campus such as greenhouses, farms, crop fields, and pastures. In addition to advising students and faculty on the garden’s design, professional engineers and ecologists served as career counselors. CH2M and Nature Conservancy experts met with W.B. Saul students monthly to help them better understand available employment opportunities in the career fields in which they were interested. “The W.B. Saul School is thrilled to be a part of this initiative and extend learning opportunities to students through the living laboratory of our campus,” said Tamera Conaway, principal of W.B. Saul High School. During last year’s White House Symposium, the green infrastructure mentoring partnership received praise for its potential for replication at other schools. With the rain garden at W.B. Saul complete, the partnership now will seek to spread the message of green construction, green infrastructure, and green careers to a new set of students.